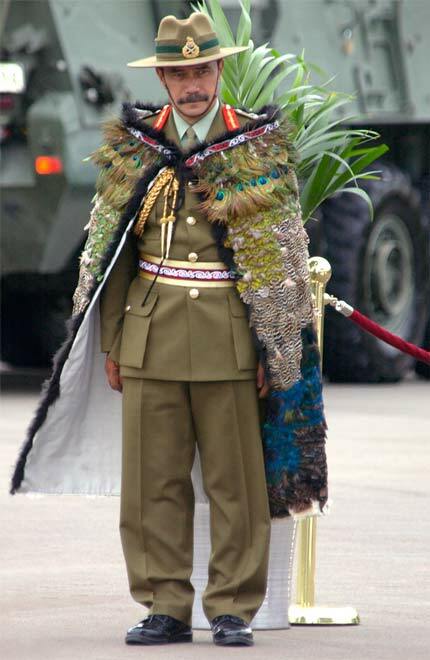 Lieutenant General Jerry Mateparae wears a traditional kākahu (cloak) at Trentham Army Camp on 1 May 2006, the day he was appointed chief of defence force. Mateparae, of Ngāti Tūwharetoa and Ngāti Kahungunu, joined the army as a private in 1972, and served in the infantry and the Special Air Service (SAS). Mateparae rose through the ranks to become a lieutenant general, and in 1998 commanded the Truce Monitoring Group on Bougainville. From 1999 to 2001 he was joint commander of the New Zealand forces in East Timor. In 2002 Mateparae was promoted to chief of army and in 2006 he became chief of defence force. After a short stint in 2011 as head of the Government Communications Security Bureau, Mateparae was appointed governor-general, a role he held until 2016.